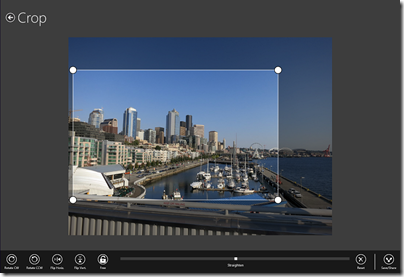 What’s coming in Windows 8.1? Microsoft is now talking in detail about Windows 8.1, essentially a service pack for the original release. Windows Vista SP1 used the same core OS as Windows Server 2008 R2, so you might reasonably expect a similar relationship between Windows 8.1 and an updated Windows Server 2012. Start button always visible on the desktop. (6) since many struggle with this. You can choose your desktop background as your Start screen background. This gets a (4) since it reduces the dissonance between desktop and Metro a fraction. New super large tiles and new super small tiles in the Start screen. Rated (6) since it will help make the all-import initial view more comprehensive on large displays. The Start screen view is now a “favourites” view. Apps do not add themselves by default (I am not sure if this applies to desktop as well as Store apps, but I hope it does). The All Apps view by contrast has everything. And you can set Apps view as the default if you want. All good changes. (5). Easier grouping and rearranging of tiles. 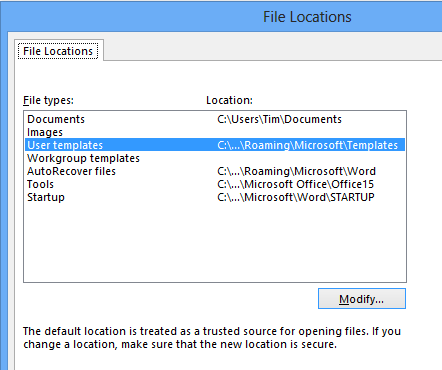 Rated (5) since this important feature is hard to find in Windows 8.0. 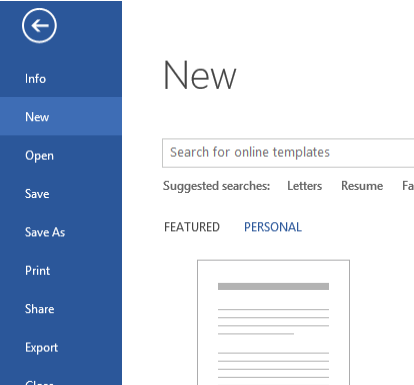 In Windows 8.1, the Search charm will provide global search results powered by Bing in a rich, simple-to-read, aggregated view of many content sources (the web, apps, files, SkyDrive, actions you can take) to provide the best “answer” for your query. I like the idea but I’m not optimistic about how useful it will be. Hedging bets with (5). Improved built-in apps. Detail not given. Rated (6) as this is badly needed but the extent of the improvements are unknown. Variable and continuous sizing of snapped views and support for multi-tasking Store apps across snapped views, multiple displays, and multiple windows of the same app. Fascinating. Handy improvements, but is Metro now re-inventing the desktop but with non-overlapping Windows as in some early windowing systems? What challenges are posed for developers who now have to deal with resizable apps almost as on the desktop? (7). Improved Windows Store with related apps, automatic background update, on-screen search (no need for Charms). (5) but what we really need is better apps. SkyDrive app supports offline files and “Save to SkyDrive”. (5) but the desktop one already supports this. Internet Explorer 11, the “only browser built for touch.” (5) as features unknown. Hmm, I have got to the bottom of the list and rated nothing higher than 7/10 Then again, I have not had hands-on experience yet. If Windows 8.1 fixes my annoying Samsung Slate unresponsive screen, that will be (9) of course. The total update may be more satisfying than the sum of its parts. For my general take though on why this will not “fix” Windows 8 see here. The Windows 8 Start screen, which occupies the full screen and uses large tiles instead of a hierarchical menu, is a contentious feature which many dislike (though there are ways to get the old Start menu back, or something very like it). Personally I like the new Start screen, though it does require learning new habits.Instead of clicking a button and navigating a hierarchy of menus, you tap the windows key and type a letter or two matching the app you want to start. You can use the same technique with the Windows 7 Start menu, though not many do. 3. Scroll right. Once you get past the alphabetical listings, the group listings appear. Somewhat long-winded, but I doubt it is worse than clicking down through the hierarchy in the Start menu, and it is not something you need to do often. Next time, just type “Spy”! The Start button is coming back. At least, that’s the strong rumour, accompanied by leaked screenshots from preview builds. See Mary Jo Foley’s post complete with screen grab, though note that this is the Start button, not the Start menu. Other rumoured changes are boot to desktop by default, and the All Apps view by default in the Start screen. Will this fix Windows 8? Absolutely not. There are two reasons. First, in one sense Windows 8 does not need fixing. I’ve been running it from the first previews, and find it solid and fast. The new Start screen works well, and I’m now accustomed to tapping the Windows key and typing to start apps that are not already on the taskbar. It is a better app launcher and organiser than what it replaces, though I am not excited about Live Tiles which are out of sight and out of mind most of the time. Second, this kind of minor UI change will not address the larger problem, which is the lack of compelling Metro-style apps for the platform. Nor will it fully placate those for whom nothing but making Metro completely invisible is acceptable. These revisions are intended to make Windows 8 more acceptable to a market that essentially does not want it to change. The core market for Windows is increasingly conservative, being formed of business users with a big investment in the platform who do not want the hassle of retraining users, and home users who are used to Microsoft’s OS and not inclined to switch. While this is a large market, it is also a declining one, with tablets and smartphones taking over many former PC roles, and Macs increasingly the platform of choice for high-end users who need the productivity of a full OS. Rather than content itself with a declining market, Microsoft came out with its bold re-imagining of Windows, with a new tablet-friendly app platform, while keeping faith with the past by preserving the desktop environment. Predictably, this was not a hit with the conservative market described above; in fact, it was the last thing they wanted, confusing and alienating. Microsoft made it particularly hard for these users by making the new Metro environment hard to ignore. The Start screen, some settings, default apps for file types including images, PDFs and music, and power button hidden in the right-hand Charms menu all cause confusion. Only the modern app platform has the potential to lift Windows beyond its large but suffocating and declining market of change-resistant users. Unfortunately the first months of Windows 8 has been more or less the worst case for Microsoft. Existing users dislike it and new users have failed to embrace it. THIS IS NOT A LAPTOP. It runs the dreadful Windows RT which is NOT windows 8, but a very poor limited version of 8. You can only download what Microsoft wants you to have. It came with a free Norton. The dealer convinced me that the failure to be able to download this was my deficiency. NOT – Norton cannot be downloaded onto RT machines. Neither can any other security software except defender which is already on it. You cannot install Chrome (much better than Explorer) It does not accept I tunes, You cannot dispense with the Microsoft log in password, which I do not need. Where the instructions for how to change the settings are, is still a mystery – as usual THERE IS NO INSTRUCTION MANUAL IN PAPER. You have to hunt for everything or go to an online forum. A shame, because personally I like the concept of Windows RT with its low power consumption and nearly tinker-proof OS. Is there hope for Windows 8? Sure. The core of the OS is excellent on the desktop side, less good on the Metro side but this can be improved. 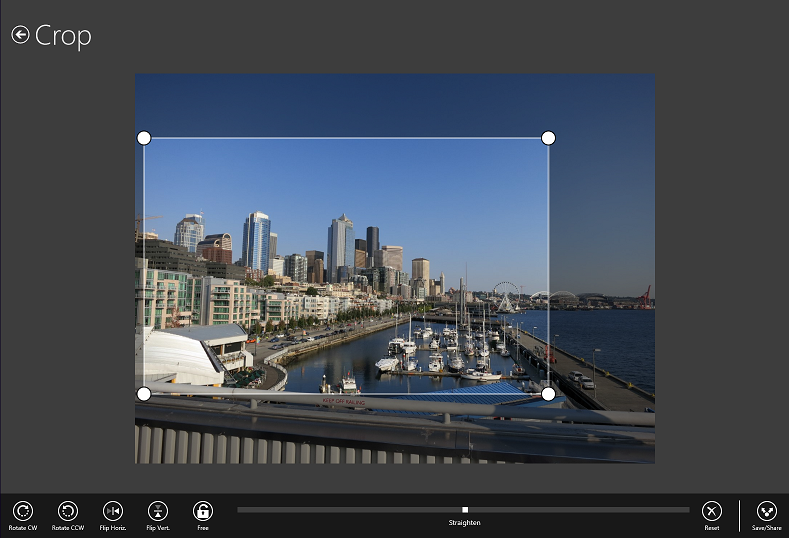 The app story remains poor, though occasionally a decent app comes along, like Adobe’s Photoshop Express: easy, fluid, elegant photo editing which works on both ARM and Intel. It is fair to say, though, that Microsoft and its partners have plenty of work to do if they are to make this new Windows a success. I have a custom Word template which I use for transcribing interviews (it lets me start and stop the audio with a key combination). I installed this into the location defined for user templates. This option is in File – Options – Advanced – File Locations. However, when I chose File – New in Word, my custom template did not appear. 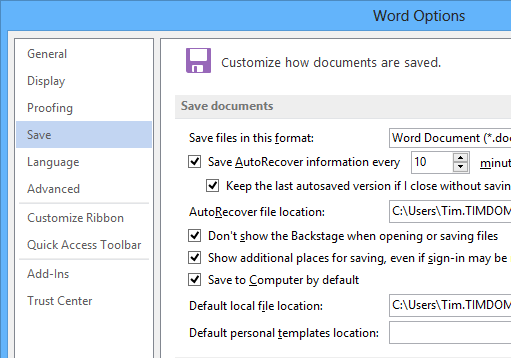 The reason, I discovered, is that Word has an additional option which sets the save location of personal templates. This was blank in my installation. You have to set this to be the same as the user template path in File locations. 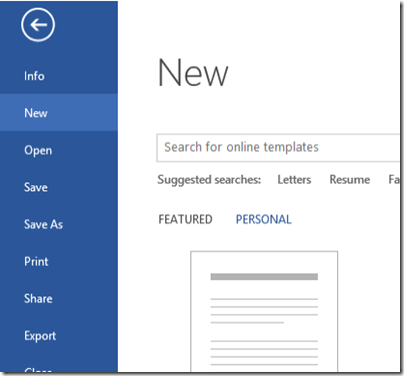 After you do that, personal templates show up when you do File – New. Note that you also have to click on the PERSONAL heading before you see them. It works. Now for a little rant. Why are there two locations? What is meant to be the difference between the location for user templates, and the location for personal templates? 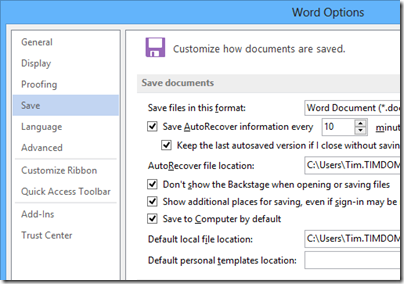 Why does a Save location impact what happens when happens when you are starting a new document? How did the personal template location get to be blank? If one of these locations is blank, why is Word not smart enough to have a look in the other one? I guess this may be a bug. While I am on the subject, it appears that there is no automatic way to sync custom templates across different Office installations, even if you sign in with the same account. A shame. Windows in Xbox One: a boost for Windows 8 apps? What if the just-announced Xbox One runs Windows 8 apps? Could this be the boost that Microsoft’s store and app platform needs? Microsoft has yet to describe the app story for the One in detail, but it would make sense. Here is what we know, as I understand it, though it is no doubt an over-simplification. Xbox One is described as having three operating systems: a virtualisation host, a Windows OS for general purpose use (including web browsing, Skype, and I would guess the management app), and a dedicated games OS. The games OS runs in parallel, so you can do instant switching between a game and other activities like watching TV, or have a Windows 8-style snapped view where both are visible. The Apps element on the One will, I presume, be part of the Windows OS. There is considerable commonality between the demands of a touch UI and that of a TV UI (where you are sitting well back from the screen). A touch UI demands large targets so you can hit them with fat fingers, while a TV UI requires large targets so you can see them from a distance. It could be that the tendency towards large, chunky controls in the “Metro” Windows 8 UI is partly driven by planned support for Xbox, even though this tendency is frustrating for desktop users sitting close-up to large screens. It is unlikely that Microsoft will introduce a completely new app model for Xbox One. Rather, I would expect to see some compatibility between Windows Store apps and Xbox One apps, with differences to account for the different platforms. No accelerometer or touch control on the Xbox One, for example, though you have Kinect which enables a touch-like interaction though hand detection. What about the OS partitioning? This may mean that the powerful One GPU will not be available to app developers, or that game apps follow an entirely distinct development model. If developers can easily share code between Xbox One apps and Windows Store apps, with Windows Phone 9 added to the mix at some future date, will that be enough to get some momentum behind Microsoft’s app platform? Xbox One hardware is not compatible with Xbox 360 games. We designed Xbox One to play an entirely new generation of games—games that are architected to take full advantage of state-of-the-art processors and the infinite power of the cloud. We care very much about the investment you have made in Xbox 360 and will continue to support it with a pipeline of new games and new apps well into the future. This contrasts with the considerable compatibility effort made in the 360, which runs some (but not all) original Xbox games despite having an equally different architecture and a switch from Nvidia to ATI for the GPU. The way this works on the 360 is that when you put in a compatible original Xbox game, it downloads a patch to enable it to run. I am not sure of the details, but there is some kind of compatibility or emulation layer combined with game-specific code to fill any gaps. This may not seem a big deal to Microsoft, but in a family context it matters. Space in the living room is at a premium in many households, and lack of compatibility means a difficult decision. Replace the old 360 and abandon all that investment in existing games? Have both side by side, adding complexity and clutter? Or pass on the new Xbox and rely on your iPad or Android tablet for fun new games, as the 360 fades from view? What will happen to classic games as the consoles which run them crumble? Emulation is the answer, and enthusiasts have come up with solutions for many obsolete consoles. In other words, we will end up running those games on PCs. For example, check out Cxbx for an ongoing effort to run original Xbox games, though progress is slow. 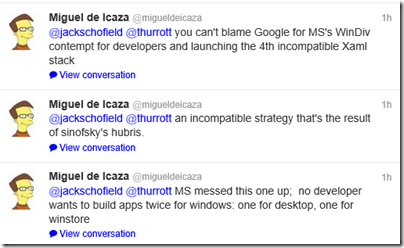 Xamarin’s Miguel de Icaza (founder of the Mono project) has complained on Twitter about Microsoft’s Windows Division’s “contempt for developers” when it created the Windows Runtime and a “4th incompatible Xaml stack”, in a conversation prompted by the company’s spat with Google over the YouTube app for Windows Phone. Google wants this removed because it does not show YouTube ads, to which Microsoft counters that the API for showing these ads is not available. 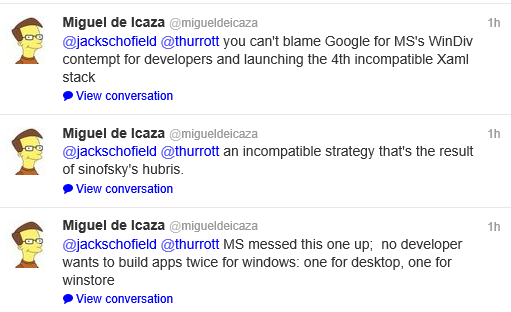 I am more interested in his general reflections on the wisdom (or lack of it) shown by Microsoft in creating a new platform for touch-friendly apps in Windows 8, that lacks compatibility with previous Windows frameworks. “No developer wants to build apps twice for Windows: one for desktop, one for winstore” he also remarked. The four XAML stacks are Windows Presentation Foundation, Silverlight (for which de Icaza created a version for Linux called Moonlight), Windows Phone (which runs a slightly different version of Silverlight), and now the Windows Runtime. Could Microsoft have done this differently, without compromising the goal of creating a new tablet personality for Windows rather than continue with doomed attempts to make the desktop touch-friendly? It is worth noting that the Windows Runtime stack is by no means entirely incompatible with what has gone before. It still uses the Windows API, although parts are not available for security reasons, and for non-visual code much of the .NET Framework works as before.